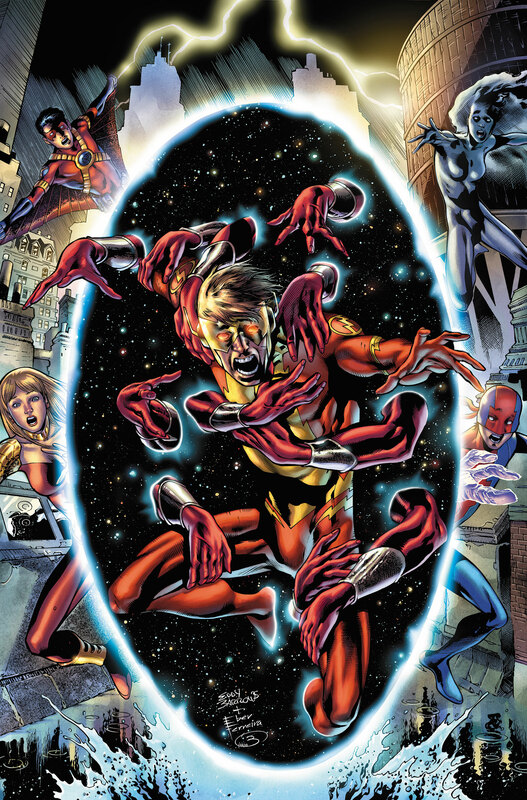 As we left the Titans last issue, Kid Flash was being pulled into a portal against his will. Can Bart be saved or must he face a past that he doesn’t even recall? And, now that the big battle against Trigon is out of the way for now, can the Titans heal the strained relationships in their own ranks? That’s where we pick up in issue #23 of Teen Titans. 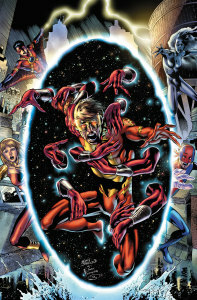 The Titans pull together in the attempt to save Bart from the portal, in the process setting aside a lot of internal strife that has recently been playing out. It gives the chance for the team to realize what is most important in their own lives, and what they truly mean to each other. That’s in many respects the overall theme of the issue, as we see vignettes involving all the couples we’ve come to enjoy following here. And, if there is one other important thing we’ve learned, its that the people trying to get to Bart aren’t necessarily the good guys – just what DID Bart get into that he still can’t recall? There is a major farewell at the end of the issue – I won’t spoil who is going away, but it saddens me as the writing for this character was really developing into something great. Hopefully we will see more of this Titan later on. This issue is in a sense an epilogue to a larger story arc, so you won’t see tremendous battles going on – yet it is still a great piece to learn more about the relationships in the team. Scott Lobdell did a great job with the script, showing us more of what makes each character tick. The pencils and inks were expertly handled by Robson Rocha and Wayne Faucher, with great color work by Pete Pantazis. You won’t find huge battle sequences and fast-paced action throughout the issue…but if you are new to the New 52 version of the Titans, this will give you a good sense of the characters, and it is a nice change of pace. This entry was posted in Reviews and tagged Bar Tor, Bart Allen, DC, DC Comics, Kid Flash, Pete Pantazis, Robson Rocha, Scott Lobdell, Teen Titans, Teen Titans #23, Wayne Faucher on September 2, 2013 by Ed Garrett.